Abdominoplasty, commonly referred to as a tummy tuck, is a popular cosmetic procedure for flattening and shaping the abdomen, accomplished by removing excess fat and skin, and tightening the muscles in the abdomen. Dr. Chaudhari has been performing tummy tucks for many years. The results are excellent, and patients are thrilled with the look of a new, flatter abdomen. Call (281)677-3340 to schedule your consultation! The best candidates for a tummy tuck are patients in overall good health, and in good physical condition, with pockets of fat or loose skin that wont respond to traditional diet and exercise. This procedure can also benefit older, slightly obese people whose skin has lost some of its elasticity. Tummy tucks can also restore and tighten skin and muscles that have been stretched during pregnancy. We advise patients who plan to become pregnant again to postpone a tummy tuck until after theyre done with childbearing, since results of the procedure will likely diminish with any additional pregnancies. The same is true for patients who are shedding extra pounds, since skin in the abdominal area typically loosens after substantial weight loss. We work hard to help each patient achieve the look they desire, therefore we devote time during every pre-operative consultation to learn what patients want to achieve from a tummy tuck, both for their bodies and their self-confidence. Cosmetic procedures are not one-size-fits-all, so we listen closely to provide patients with a completely customized treatment designed to address the patients specific goals. 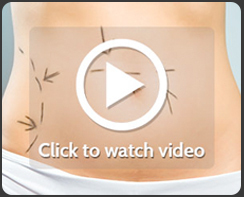 Tummy tuck surgery takes approximately four hours and is performed under general anesthesia. This procedure may be performed on an in-patient or outpatient basis, depending on the complexity of the surgery and Dr. Chaudharis recommendation, based on the pre-operative consultation. The procedure is performed using two incisions: one from hipbone to hipbone close to the pubic area, and another small incision around the navel. The skin is then separated from the abdominal muscles, and those muscles are then pulled together and stitched into place for a firmer abdomen and narrower waist. The skin is stretched down and over the newly tightened muscles, excess skin removed, and the navel is brought out through the skin in a natural position. Finally, Dr. Chaudhari will place some drains, close the incisions, and apply sterile surgical dressings over the sutured areas. Though rare, the risk of post-operative complications does still exist with any surgical procedure. The potential risks of abdominal surgery include infection, blood clots, and poor healing, which may require further surgery. Patients who have had previous abdominal surgery should know that old scars could be raised, stretched or generally more noticeable after a tummy tuck. In these cases, a scar revision procedure after a tummy tuck can help minimize the appearance of unsightly scars. The results of the tummy tuck are a flatter, more toned abdominal area, and patients report that they not only look younger and slimmer, but that their new look provides an extra boost of confidence as well. The results of a tummy tuck are visible right away, and continue to improve over time. With a balanced diet and regular exercise, results are long-lasting. Scars will fade with time, leaving the stomach sleeker and more defined than ever before. The surgical scar spans the lower abdomen from hip to hip, but Dr. Chaudhari is very careful to make the incision low enough for even a bathing suit to conceal the scar. A Partial abdominoplasty, or mini tummy tuck, is similar to a full tummy tuck procedure and yields the same excellent results. The mini tummy tuck requires a shorter incision and the skin is only lifted to the navel, which does not have to be moved, as it does in the full procedure. This option is ideal for patients who need just a little improvement to get to their desired appearance. If youre interested in a tummy tuck, but not sure which procedure is right for you, contact us to schedule a tummy tuck consultation. Dr. Chaudhari will discuss with you the differences between the two procedures and help you weigh the benefits and risks to determine which procedure is best for you.